The Green Schools Are Coming, The Green Schools. . . - Archpaper.com The Green Schools Are Coming, The Green Schools. . . The Green Schools Are Coming, The Green Schools. . . So we’ve got schools with green roofs sprouting in D.C., Manhattan, the Bronx, and who knows where else across this fine country of ours. (If you’ve got more, email us, we’d love to hear about them.) Not content simply with the mantle of “country’s oldest public school,” Boston Latin has decided to add a green roof as well. Designed by Studio G Architects, this one’s a whopper, covering 50,000 square feet with areas dedicated to growing crops for the cafeteria and providing lab space for science classes. At that size, maybe they could even find some room up there for some mini golf or a tennis court. More renderings and details after the jump. 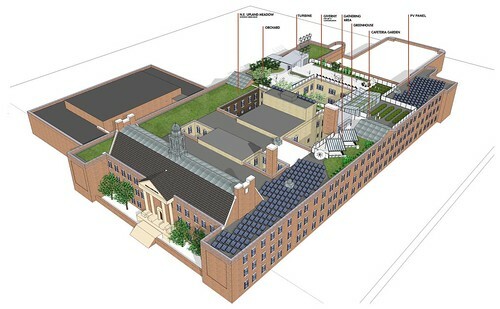 The oldest public school in the nation, Boston Latin’s green roof is significant in that it was conceived by a group of students who, after seeing An Inconvenient Truth, formed BLS YouthCAN (Climate Action Network), lobbied BLS administration to implement the green roof concept idea, participated in the development of designs, and are spearheading fundraising efforts for the $5 million project. Studio G Architects of Boston was so impressed by the energy and commitment of the students that they donated design services for the project. The roof’s numerous program areas will create a variety of new learning opportunities for BLS students and schools across Massachusetts. State-of-the-art STEM (science, technology, math & engineering) labs form the backbone of the design, enabling students to observe and measure data related to the school’s environmental technology, like calculating the amount of energy being generated by the PVs or the wind velocity of the turbines. A cafeteria garden, greenhouse and orchard demonstrate the accessibility of fresh local produce and help encourage healthy eating habits. A contemplative garden offers a space for repose or for language, art and music classes. 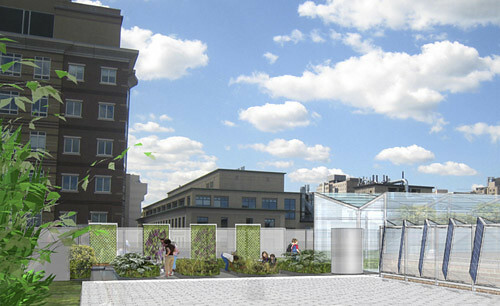 Besides the inherent sustainability of training urban kids to be good stewards of the environment, the green roof will lower BLS’ carbon emissions through its planted microclimates, while PVs and turbines will offset its energy consumption. These diverse programming opportunities have inspired an entirely new sustainability curriculum, which is being piloted at BLS this fall and will be available to the other 17 YouthCAN chapters throughout Massachusetts, thereby extending the impact of this revolutionary program space to students beyond BLS. Students tend the garden section of the roof.